Intricate and elegant of design, the Medieval Scapini Tarot seeks to capture the artistic wonder of the Middle Ages and the Renaissance. Cut the deck and lay a spread and discover the hidden meanings found in the symbolism, style, and settings of the Major and Minor Arcana, all beautifully rendered by Luigi Scapini to bring your divination to life. ""While this is a contemporary deck, one would think it had been delivered in a time machine from the renaissance!"" Italian artist Luigi Scapini’s lavish paintings recreate 15th century Italy in this gold-accented tarot deck. The Major Arcana and court cards have gold backgrounds in the manner of fifteenth-century European decks. Both the Major and Minor Arcana include full scenes. In the Minors, symmetrical arrangements of the suit symbols provide composition around which the scenes are arranged. The trumps all appear over an elaborate golden background and have a luxurious feel. When splayed out across the table in readings they stand out and make quite an impression. While quite detailed, the trumps are also more straightforward in appearance and require less effort to quickly seize their meaning. The pip cards, on the other hand, are a gold mine of symbols and interpretive sources. Scapini has a way of creating a wealth of imagery in a card that allows your gaze to be seized by one thing, only to then pull the eye from a large image to a smaller one buried within it, complete in itself. For example, you may notice the cup held in someone's hand on the card, then suddenly what once was only fine detail decorating the cup you now notice is a tiny, yet communicative image of a person crouched down and shedding tears. Each time I look at a card I find I've just seen another new detail. U.S. Games Systems, Inc. 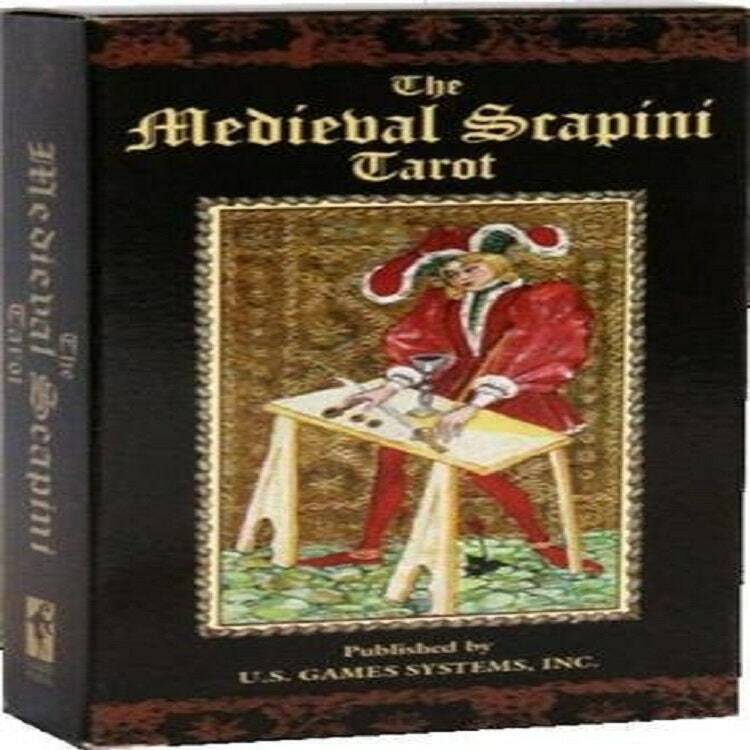 The 78 cards of the Medieval Scapini Tarot recreate the Middle Ages of Europe with symbolism, costume and settings. Pls. note that being a new card item, the photos in the listing are the published photos of the item manufacturer in compliance with any copyright and trademarks rights that may belong to actual manufacturer. This deck is truly an eye opener to the medieval decks out there. As a first deck for those searching for a good starting place this deck is superb. The deck is longer than you think, so be warned! However, the colouring is amazing.